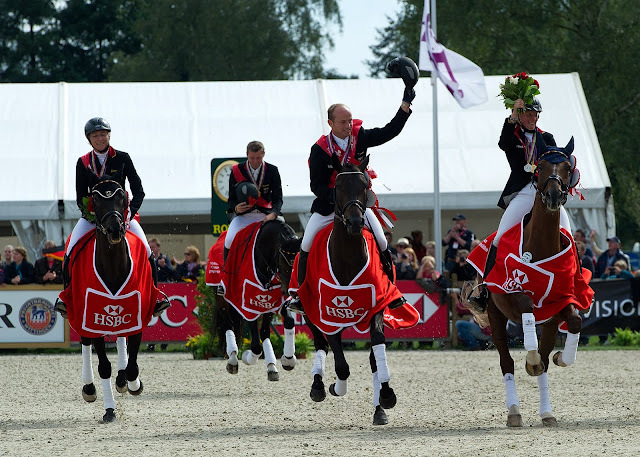 There were jubilant scenes as Michael Jung (GER) was crowned European Champion and his team deservedly took gold in a nail-biting finale to the HSBC FEI European Eventing Championships at Luhmühlen (GER). Although a German victory had never been in doubt, the final score sheet was considerably re-arranged after the unfortunate Ingrid Klimke (GER), who had led the first two phases with such flamboyance, suffered the devastating experience of hitting six fences and dropping to 11th place. The individual medals were still a German whitewash, though, as the hugely talented Sandra Auffarth jumped clear to take individual silver and Frank Ostholt moved up two places to achieve his first individual medal. Ostholt’s wife, Sara, who was best of the fourth-placed Swedish team, also suffered a dramatic drop down the order. There had been a run of clear rounds as the higher-placed riders found the key to this technically-demanding track. Algotsson-Ostholt had her much-admired mare Wega jumping beautifully until a misunderstanding on the approach to the final double at fence 11. The mare hit the first part and then ran out at the second element. Eighteen penalties dropped her to 12th place but the team held onto fourth and, more importantly, earned their ticket to next year’s Olympics in London. The French were only fifth after Dressage but the dashing trio of Donatien Schauly, Nicolas Touzaint, and Stanislas de Zuchowicz (Pascal Leroy was eliminated after a Cross Country fall) all jumped superb clear Jumping rounds and moved up to take team silver and earn their slot at London 2012. Great Britain dropped to bronze – the first time they’ve missed gold since 1993. The defending champions started to look vulnerable when Nicola Wilson and Opposition Buzz hit the first fence and, with another error from Piggy French, William Fox-Pitt had no room for error. 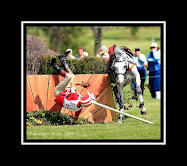 When Cool Mountain rapped the third fence, it was all over. The last time there was a one-nation whitewash of the medals was in 1991 when Great Britain took team gold and all three individual medals. Naturally enough, the Germans were ecstatic with the result. Michael Jung – “It’s an absolute dream,” Michael Jung said, “and that it happened in Germany and here in Luhmühlen is even more exciting. To have four first places is exceptional for any nation." Jung now joins Mary Gordon Watson (GBR), Ginny Elliot (GBR) and Zara Phillips (GBR) in the elite band of riders who have held World and European titles simultaneously. He is Germany’s first individual European Champion since Bettina Hoy in 1997, and this is Germany’s first European team gold since Kiev (RUS) in 1973. Michael, 29, is perhaps the most talented natural horseman to emerge from Germany in recent years. He made his CCI4* debut in 2009 at Luhmühlen and won, on La Biosthetique-Sam, following up with victory in the HSBC FEI World Cup Eventing™ Final at Strzegom (POL) and an individual bronze medal in the HSBC FEI European Eventing Championships at Fontainebleau (FRA) in the same year. In 2010, he again topped the HSBC FEI World Cup rankings and went on to win the individual World title at the Alltech FEI World Equestrian Games™ in Kentucky, again on Sam, owned by Sabine Kreuter. 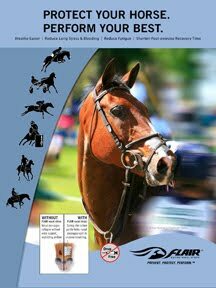 His family runs a riding establishment at Horb, in the south of Germany near Stuttgart. Sandra, 25, has been the discovery of the championships, making her debut on the senior German team. 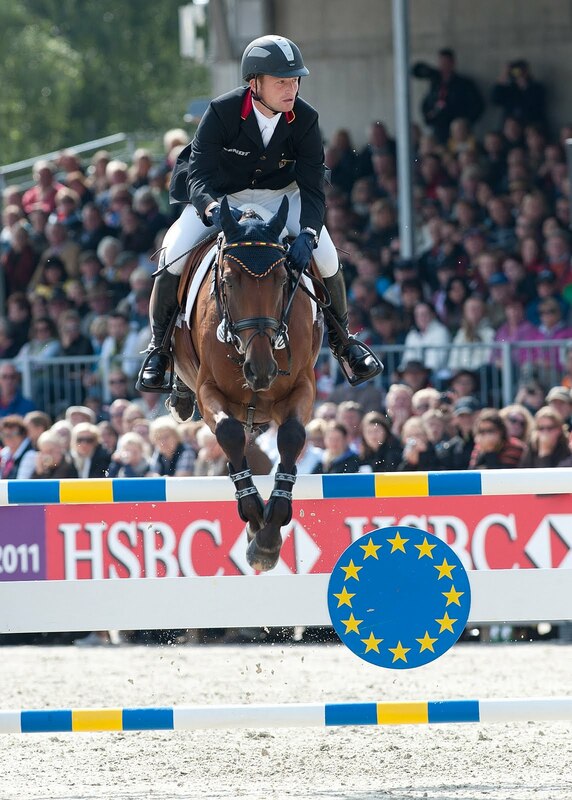 She won a team bronze medal in the Young Rider Europeans in 2006 and is a former national Young Rider champion. She took over the ride on Opgun Louvo, one of the youngest horses in the championships, three years ago and finished ninth at Boekelo CCI3* last year. She made her CCI4* debut at Luhmühlen in June, finishing second. Sandra is based at Warendorf. Frank, 36, has been a member of the senior German team since 1993. Riding his best-known horse, Air Jordan, he was a member of the fourth-placed German team at the Athens Olympics in 2004, won European team bronze in 2005 and World team gold in 2006. They also won Luhmühlen CCI4* in 2006 and were placed at Badminton CCI4* in 2007. Riding Mr Medicott, he won Olympic team gold in 2008 in Hong Kong. Frank is married to Swedish team member Sara Algotsson-Ostholt. they are based at Warendorf and have one young daughter, Wilma.